It’s happened to people you know. They visit Taos to ski or raft the Rio Grande. Next year they’re back looking at land. Just a little property, they tell you, something for an investment, the prices are quite reasonable now. Next thing you know they’ve built a house-maybe just a little house, a ski cabin-or maybe an adobe mansion. What is it about Taos, New Mexico, that calls us so seductively? No matter where in the world I travel – from Amsterdam to Tasmania – when I say I’m from Santa Fe, people light up with recognition of the name. Some have visited here and seen first hand our unique Pueblo-style architecture, visited some of our more than 200 art galleries, wandered our meandering, European-like lanes, delighted in our multi-cultural festivals, skied or hiked our mountains, eaten green chili, and experienced the quality of the light made famous by generations of artists. Others have simply heard about it, and whatever they have heard is positive. [Read more…] about New Mexico – It’s better on a bike! 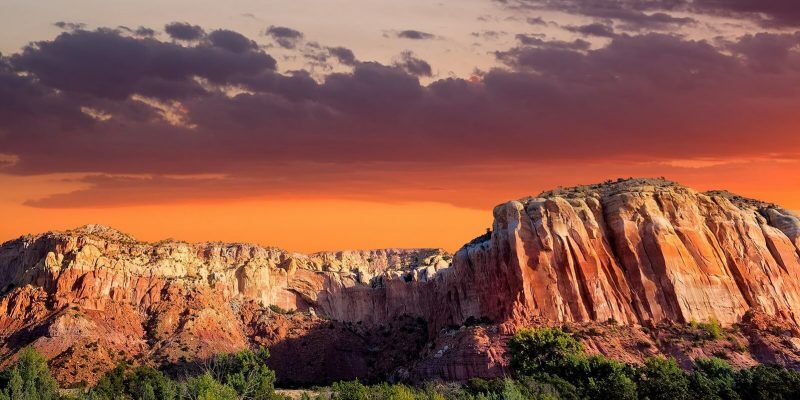 Just beyond Espanola, the road begins to wind through beautiful red cliffs and canyons where within twenty-three miles you will find yourself at the secluded funky little hot springs resort town of Ojo Caliente. Brightly colored paints decorate cafes and businesses in the New Mexican folk style.